Our August star party at Gettysburg Flag Works was a hit! We had a total of 7 volunteers working on several parts of the star process. There are several steps before it can be handed to a soldier or veteran. Here’s a group photo (missing 3 people unfortunately). When packages of flags arrive for Stars For Our Troops, they are stacked up and logged in so that we can send a thank-you and a couple of stars to the kind people who’ve sent us their old flags for this great cause. Each box is opened and the flags inside are inspected to see if they are usable for the project. 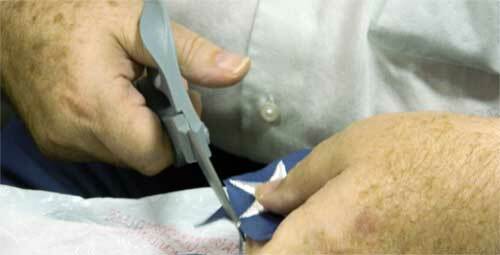 Usable American flags are made in the USA and have embroidered stars that are about the height of a business card. Any taller and they won’t fit into the baggies that we use, and won’t be convenient for carrying in the soldiers wallet or pocket. Once all of the flags have been checked in, we cut the star field from the stripes. It’s a process also used by the scouts during their retirement ceremony. Each star field is then washed to remove any dirt or allergens it’s collected during it’s flying life. We do this for the health and comfort of not only the star-makers but also for the veterans and soldiers who will receive the stars. It also shines up the stars and gives them a new lease on life. When the star fields are clean and dry, it’s time to cut each star from the field. 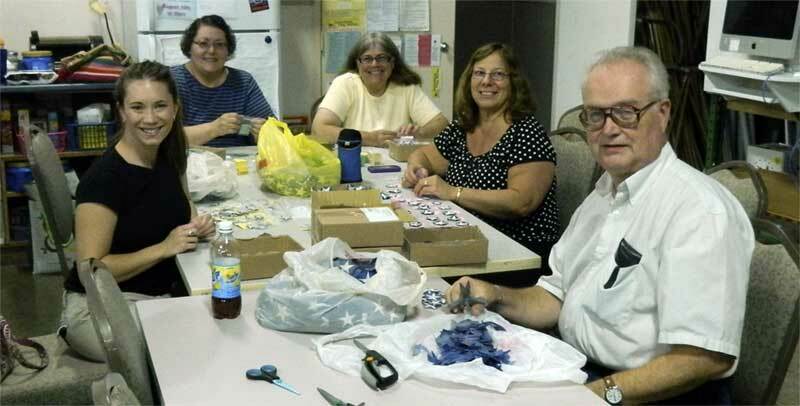 This is a tedious process that our volunteers do at star parties – like this one – or at home. It’s easiest on the hands when done in shorter times rather than all at once. You can imagine how long it takes with 50 stars per field and at least 5 cuts per star! 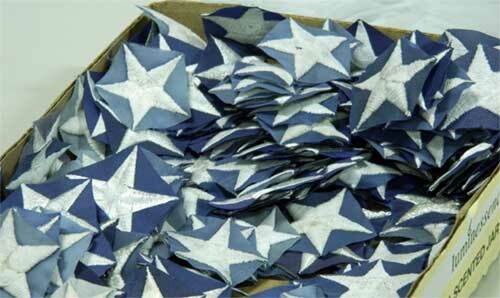 Trimmed stars are saved up in bags and boxes for the next part of the process. 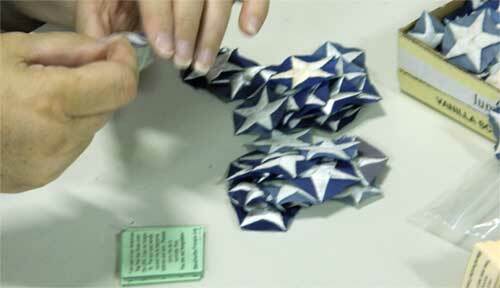 Many of our star-makers have become experts at pouching the stars with the little notes into their plastic baggies. It starts by laying out the notes face-down and placing a star on each one. You will see that most embroidered stars have one side that’s “prettier” than the other. We like to face the pretty side out so that side faces up when it is in the pouch. And then each one goes into a plastic pouch. It’s a lot of work but when you’re done, each and every pouched star will touch a life. For some veteran’s, it’s a thank-you that has been much too long in arriving. For a deployed soldier it’s a reminder of the friends, family and even strangers thinking of them back home. 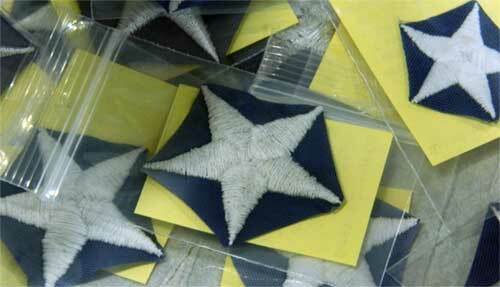 Many hold these stars with them at all times, in pockets, wallets or helmets. Other’s share it with a friend creating a cycle of gratitude and caring. Thank you for taking the time to learn more about Stars For Our Troops. We would love to see you at an upcoming star party! Find out about future dates and more about the organization at www.starsforourtroops.org. Cheryl has been with Gettysburg Flag Works since 1999. She shares GFW's message with the community on and offline. How do you determine who receives a star? Do individuals submit names of soldiers and veterans to you? Lisa, There’s all different ways. Visitors at Gettysburg Flag Works can grab a few stars to hand out themselves or you can request stars (for yourself or others) at http://www.starsforourtroops.org/. You’ll see that Susan is at many of our area military and veterans events handing them out as well. I work at a hospice, so we all carry them to give to our patients or their families who have served. I also keep two or three in my purse and randomly hand them to an active duty serviceman or a veteran that I see in my daily travels. Veterans are all around us, if we only care to look and see their ball caps or other self-identifying attire. I would like to help in the 12306 area. Lynn, Please visit http://www.starsforourtroops.org/ and contact Susan about opportunities in your area. 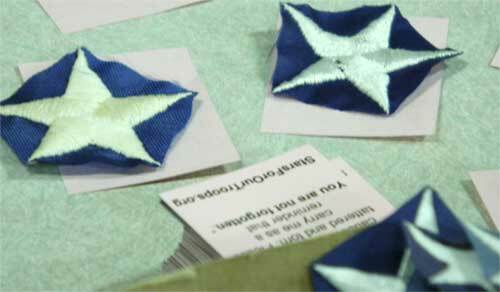 Would like directions on making the stars for our troops. I would love to hold a star party. I live in White Plains, NY. I am already involved in lots of Veteran/soldier events as well as Honor fLight. Would love to include stars with Honor Flight Mail! Please let me know if this can be done by me locally. I have lots of crafting friends or it could be done by the MS students at the small private school I work at. We are adopting the 3 shelters that Westchester County runs for veterans where they house 85 veterans. This sounds like a perfect thing to give each of them. Hi Paulette, please contact Susan from the Stars for Our Troops program for answers to these questions and any other help.